Hulu has updated its Hulu Plus app for iOS with a brand new look, new navigation options and in-app subscriptions, allowing users to subscribe to the service and create Hulu Plus accounts within the app. 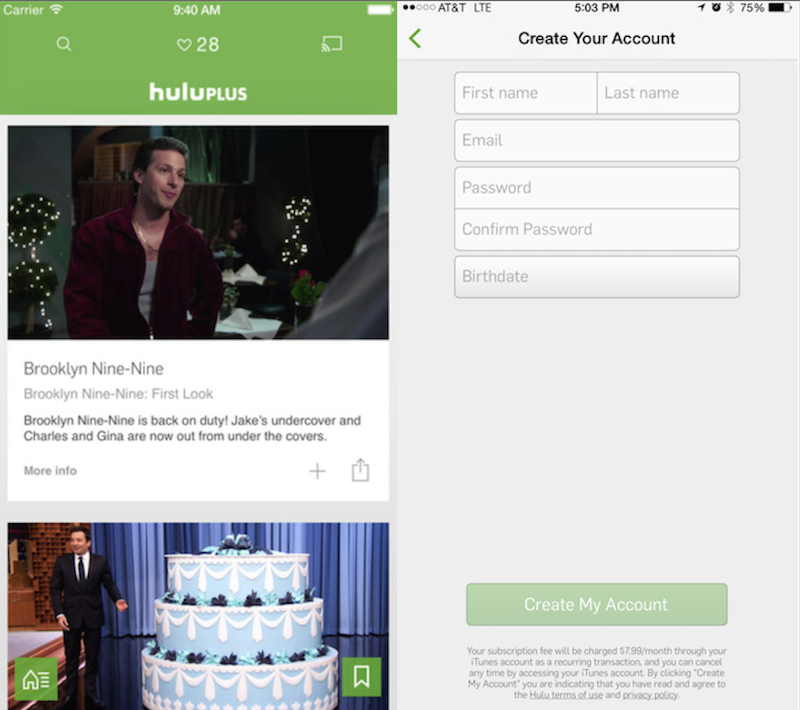 In 2011, Hulu had complied with Apple's rule to remove links to external mechanisms for subscriptions as well as the ability to sign up for accounts. The rule forced developers to use iOS' in-app subscription feature and granting Apple 30 percent of the subscription fee. However, as GigaOm notes, it's likely Hulu has realized that the ability to gain subscribers from mobile users is more important than giving 30 percent of its mobile subscriber fee to Apple. Additionally, the apps are also now optimized for iOS 8, iPhone 6 and iPhone 6 Plus. I will never support Hulu. Such a ripoff having to pay to watch shows that they broadcast for free over the air. Especially stupid that even after you pay you have to watch the same amount of ads. Screw you Hulu! "Would you like to skip this ad for $0.99?" Hulu became obsolete years ago. Let me guess... if your device has a Ctrl key, a lot of content (such as current network shows) is free; but if you do NOT have a Ctrl key, you have to pay for EVERYTHING? I'm not interested in this app until that absurdity changes. Crackle, the ABC and Fox apps, PBS, YouTube, etc. etc. all send the same content to ANY device, with the same paywall if any, without caring whether it's a traditional 1900s-style computer or a touch-based one. I watch shows on hulu plus a lot, but having to pay for it with tons of ads is obnoxious. The only thing that I want is no advertisements :D.
Says who? It's decent for catching up on current shows. Ads and episode expirations gotta go though.